We offer educational programs and host non-profits for private events, at minimal cost for attendees and organizations. Conveniently located at the edge of the west metro, our lakeshore, meadow, and forest are waiting for you. Charlson Meadows allowed our group to relax together in a beautiful space. This contributed to a great deal of quality work. Actually, we achieved more than I had planned and moved our future plans forward in a deeper way." Our gathering spaces, both indoors and outdoors, are designed to be inspiring and beautiful. The Nancy Nelson Lake House will feel like home, yet serve your needs for a lecture style or collaborative meeting in our Gathering Room. Meet by the fireplace in the living room or enjoy the view of Lake Zumbra from the sunroom. At Charlson Meadows we encourage all of our guests to plan to spend time in nature to enjoy the benefits of restoration and renewal. As a group you can gather at our outdoors spaces or simply enjoy a community walk together on the trail. Classroom space with large screen and seating for 30 theater style or 20 with various table formations to suit your meeting needs. Meeting spaces for smaller groups include living room, lounge, library, formal dining room, kitchen island, and covered deck. Out of doors you could visit one of three campfires-the most rustic is tucked in the woods at the waters edge. Take a walk together up to Sky Vista for a 360° view of nature for your team building. Our Lake House and Chalet offer comfortable bedrooms with private bathrooms. With a variety of bed sizes we can serve 11 with a private room and 20 with shared space. For your convenience we provide bed linens and towels. 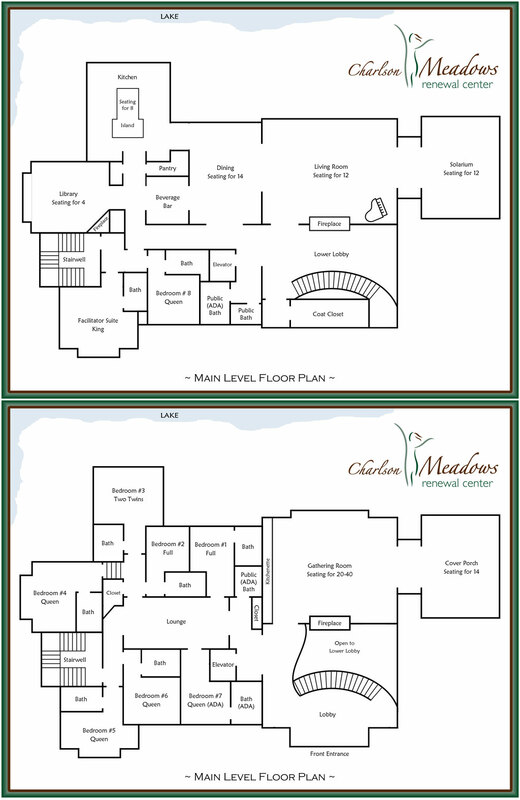 View floor plan layout. 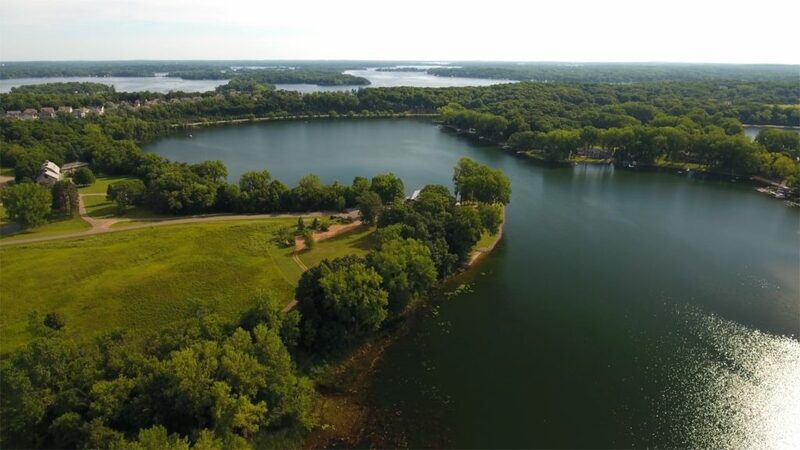 Come explore our 142 acres of meadows, woods and lakeshore. Walk the trails, ride a golf cart, or bicycle. Our exclusive Life Journey Program will help you encounter nature in a unique and restorative way. Amenities include: labyrinths, kayaks, canoe, snow shoes, kick sleds, yard games, and beach. Consider preparing your own food together in our residential style kitchen or hire one of our preferred local caterers to best suit your needs. Choose to eat your meal at the formal dining room table, in the kitchen at the island, or outside on the patio tables. Our programs inspire deeper connections with nature, self, and community. Come to Charlson Meadows and be refreshed, inspired, and renewed! Limited weekends available in 2019. Charlson Meadows hosts non profits and qualified groups. Plan your event and enjoy! What a fabulous revitalizing space you have! Thank you for generously sharing it with us for our productive meeting." Charlson Meadows does not discriminate by race, religion, gender or orientation, but we only accept groups that align with our mission and reserve the right to refuse any group on a case-by-case basis. Our adult renewal center is not available for weddings, reunions, fundraisers or other private events. © 2019 Charlson Meadows. All Rights Reserved.